All participants must register before the start of the tournament. You can enrol via this website. To determine your age group we use your year of birth. So, for example, if you are 16 but born in 2002, you should enrol for the A-group. In the A to C groups the rate of play is 1,5 hours plus an increment of 30 seconds for each separate move from the beginning of the match move. In the D- and E-group, the rate of play is 40 minutes plus an increment of 30 seconds for each seperate move from the beginning of the match. In the F-, G- and H- group, the rate of play will be 25 minutes plus an increment of 10 seconds for each separate move from the beginning of the match. This goes for both the F-, G- and H- tournament as well as the joint FGH-tournament. The playing schedule for the A to C groups is unchanged from previous years. These groups each play 9 rounds from August 5th to August 10th. The D- and E-group will be playing 13 rounds. a nine round tournament from Monday 5th to Wednesday 7th where all participants play in their own age group (F-, G- and H-group). If less than 20 participants enrol in either the G- or H-group, we'll probably combine both groups. Participants are free to participate in one of these tournaments, or both. Also, you may decide up to August 8th to enrol for the second tournament! There is a cash price and a trophy for the best three in each tournament, as you can see in the schedule below. In addition, all participants in the D-, E-, F-, G- en H-group will get a nice little prize no matter how they perform. Participants in the A-, B-, C-, D- and E-group: € 50,- for the tournament. Participants in one of the F-, G-, or H-groups (1st tournament): € 30,-. Participants in both tournaments: €50,-. The enrollment is completed when we have received payment of the entry fee on our bank account. The results in the A-, B- and C-group will be send to the FIDE. 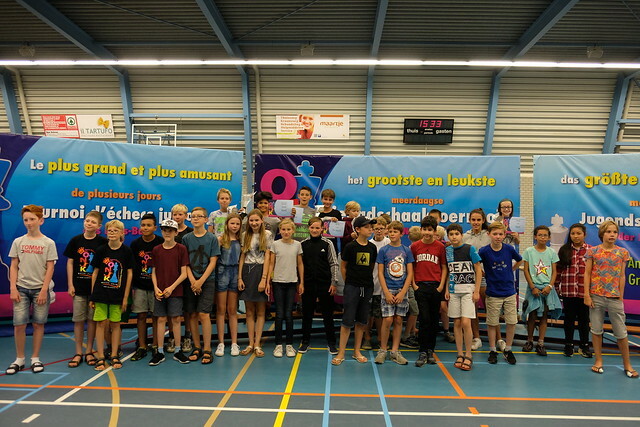 All results in all groups will be send to the Dutch Chess Federation (KNSB). If you want us to send the results to any other foreign chess federation, please contact us prior to the tournament.